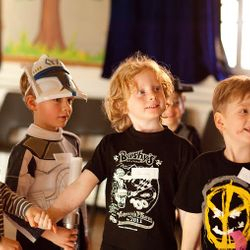 Adventure Parties, Discos, Drama Workshop Parties, Football Parties and now Holiday Workshops, for ages 3-11! At Nutty’s, we offer something a little different for your child’s party. 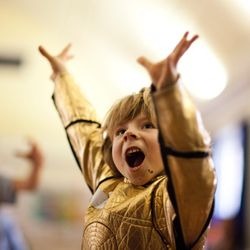 Everything we do is based on our ethos of the importance of exercising the imagination, letting young people have their ideas and feelings heard and making sure that they are immersed in a magical world of fun and adventure. We make sure that the birthday child gets a real fuss made of them on their special day- they’ll even be presented with a gold birthday medal at the end of the party! 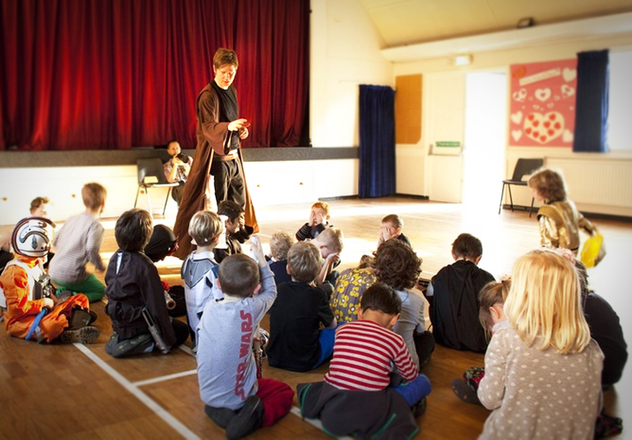 Our intrepid adventure party entertainers provide children's party entertainment in Earlsfield, Streatham, Dulwich, West Norwood, Chelsea, Herne Hill, Wimbledon, Balham, Brixton, Chiswick, Shepherd's Bush, Camden, Hampstead, Hammersmith and beyond! We offer both one and two-hour packages. In our two hour option, we offer the first hour as above, but we break for tea or lunch at the end of the adventure (for 25-30 minutes), and finish off with classic party games, such as Grandma’s Footsteps, The Blanket Game and Musical Statues. We can also offer a two-hander adventure for up to 50 guests. Maximum number of kids is 30, or 50 for two entertainers. Why not get in touch and see what we can offer you? 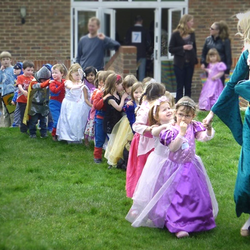 Our fun-loving, experienced children's adventure party entertainers (who are also ALL professional actors) offer a wealth of fantastic party themes, including princess-themed parties, fairy parties, explorer parties, superhero parties and Harry Potter parties to name but a few! Pirate Dan has been a good, strong, if some what slightly deaf pirate (he needs the kids to shout a lot!) all his life and was once in charge of the Magic Sweets Treasure until the chief of the evil pirates, Left Eye Crazy Bob, stole it. Pirate Dan needs the kids help to find the map that Left Eye has created, so they can go and find the treasure for themselves (a box full of sweets!) and 'help fend off evil pirates forever!'. 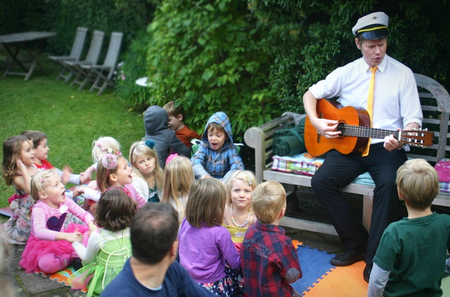 This party is our most popular and is perfect for those that are fans of Cbeebies' Swashbuckle. 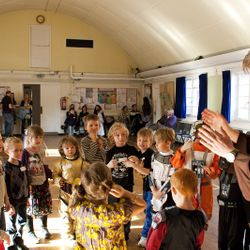 The party also works very well for large groups of over 30 kids with two actors as 'The Pirate Dans'! Ages 3-9. Shiver me timbers! We can also offer a very similar story and adventure as Pirate Dan (above) with one of our swashbuckling pirate girls! Here's Pirate Amy in action. She loves to say 'oo-arrrr'. Pirate Dan/Pirate Girl and The Dinosaur Adventure! 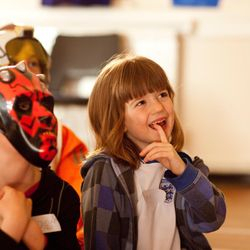 This party is aimed at kids aged 4-9 and is perfect for Dinosaur fans, and fans of the Captain Flynn and The Pirate Dinosaur books. Danijel The Space Warrior- for Star Wars fans! 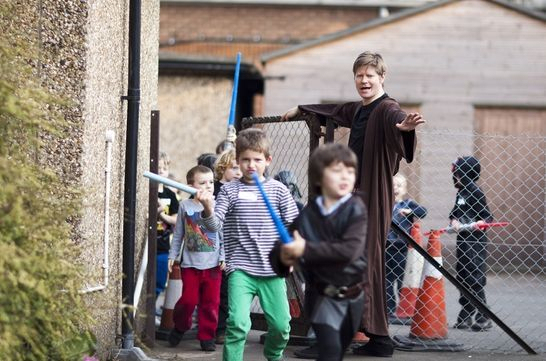 Perfect for boys and girls who are fans of the Star Wars films and are aged 4-9. Join the Space Warrior Princess on a similar adventure to Danijel The Space Warrior: this time, to help rescue her friend and fellow Space Warrior Princess- Violeta! 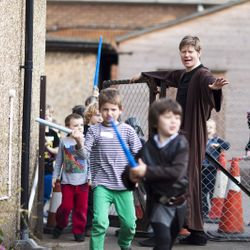 This party is aimed at 4-9 year olds and is perfect for boys and girls alike who like the Star Wars films, especially The Force Awakens and the characters of Princess Leia and Rey. Poor Witch. Despite winning the 'Most Whackiest Witch Award', her witch powers have been going terribly wrong. This is ever since the rather jealous and nasty Wicked Witch Of The North put a spell on her and now she can't fly her broomstick properly, or make potions effectively! So, she has gone back to The High School of Witchery to try and get her skills back on track. 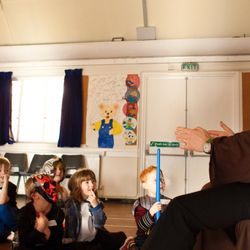 The training has been going well, but the headmistress of the school, Ms Wendy Witch III, has given the Witch one last, big challenge: to find the Wonderful Witch Sweets, that once found and eaten will help all good witches to be wonderful witches! 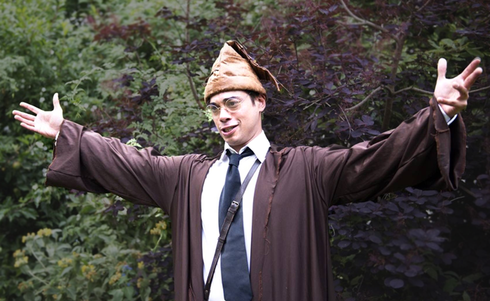 This party is aimed at kids aged 4-9 and is perfect for fans of the Worst Witch books and Harry Potter books and films. 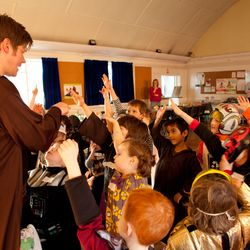 It can also be performed for large parties (over 30 kids) with Wizard Dee and is perfect for Halloween parties! Super Dan is a super hero! But, he doesn't feel too good.... Super Dan has been eating too many pizzas and his tummy is a bit sore and he has been watching too many DVD's AND is very tired- phew! So, he has been set a mission from his boss: Mr Superhero, to get him back to being strong and clever again. 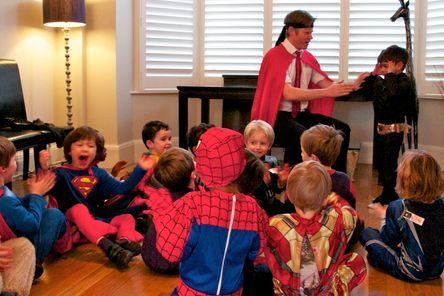 The only problem is, he needs a group of Mini Superheroes (ie. kids) to help him! 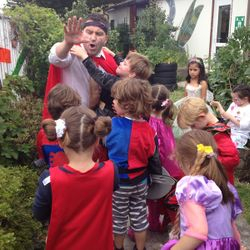 This party is aimed at kids aged 3-6 and can be for large groups (30-50 kids) as 'The Super Dans'! 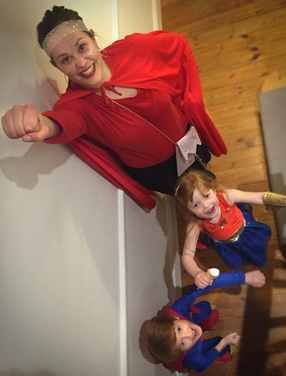 Our super-charged superhero entertainers offer this party in Wimbledon, Clapham, Balham and all over London. To infinity and beyond! 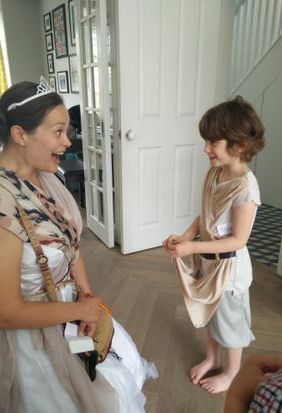 This explorer party is aimed at kids aged 3-7 and is ideal for those interested in the ancient world, animals, Dora The Explorer and the Indiana Jones films and stories. 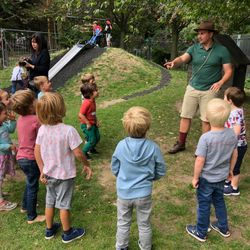 Our intrepid explorer party entertainers are in action in Chiswick, Kensington, Hammersmith and all over London! Join Explorer Dan on a unique and exciting new dinosaur adventure. Help him to find the Magical Explorer sweets that will magically allow the missing Golden T Rex Egg to travel to the British Museum so everyone can see it and enjoy it. 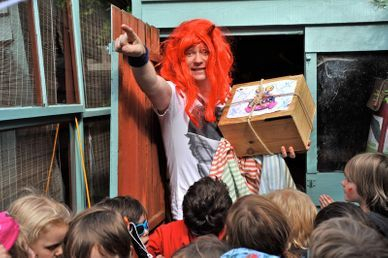 Hear his amazing stories of finding original dinosaur artefacts and go off with him in search of dinosaur clues, rescuing trapped mini dinosaurs in the gunk box, crossing the rickety bridge and avoiding the scary dinosaurs on the way!! 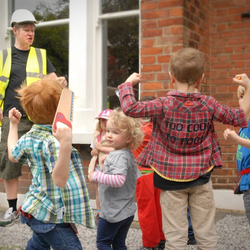 This party is aimed at kids aged 3-7 and is ideal for those interested in dinosaurs and the Cbeebies hit TV show, Andy's Dinosaur Adventures. 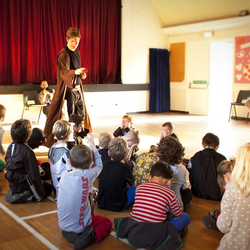 This party is aimed at kids aged 3-7 and is ideal for those interested in ancient history. 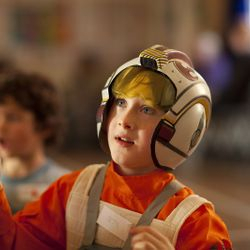 Join American Astronaut, Space Cadet Danny, on a mission like no other... His friend, Space Cadet Jake and his rocket are unwell because they have lost the Super Intergalactic Sweets- that help keep the universe in order- as a result of a nasty meteor shower! They need to go on a space mission past the moon, the stars and beyond to planet Mars to find them again. Help Space Cadet Danny by flying off in his rocket, following the clues, going through the dark Mars cave and across the Mars craters to find the sweets again! 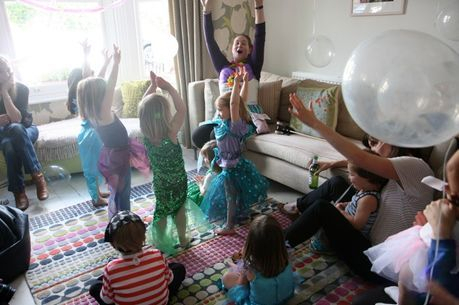 Ideal for children's party entertainment in Streatham, Dulwich, Primrose Hill, Ealing and beyond! 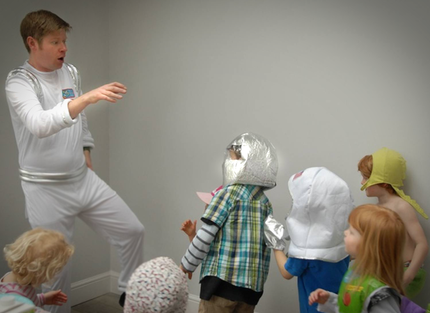 This party is aimed at kids aged 3-6 and is perfect for boys and girls alike who love space, astronauts, the stars and the solar system. Dan The Fireman loves being a firefighter. He also loves playing pool and drinking tea with his pals! But, he has a problem... He has to find the Special Sweets that were stolen from the sweet factory that went up in flames and holds the secret ingredients to make more sweets! Help Dan The Fireman go on a quest to find them by climbing ladders, sliding down poles and going through a tunnel of fire- amongst other crazy things- by using the map that was left for them by the evil criminal who has stolen the sweets, Nasty Nathaniel! 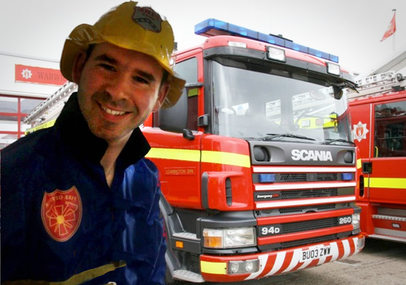 This party is aimed at kids aged 3-6 and is ideal for those that are fans of Fireman Sam. Follow Submarine Dan (a commander of the undersea) on an imaginary, underwater adventure in his amazing submarine... His quest? To rescue his friend, Oliver Octopus from the evil Stefan The Shark! Go through the sticky seaweed, up through the underwater rock, rescue the underwater creepy crawlies and take part in a creature report! 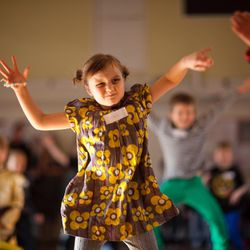 This party is aimed at kids aged 3-6 and is perfect for fans of Cbeebies favourite The Octonauts. Join Wizard Dee and listen to his amazing stories about fighting off dragons and goblins and trying his best to ward off evil. But! Wizard Dee has a problem. His magical powers aren't working properly! And he's lost his wand, which doesn't help matters... 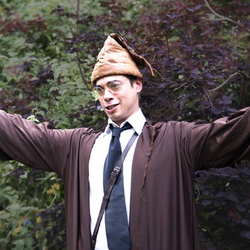 He has been to see the high master of Wizardry, King Wizard IV in his homeland of Niorama, and he has said that he needs to find a group of young wizards, witches and fairies to help him on a magical journey to find the 'Magical Sweets' to help restore his magical powers! 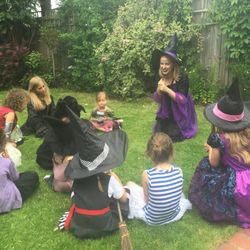 This wizard-themed children's party is perfect for boys and girls who are fans of the Harry Potter books and films and Meg and Mog stories. 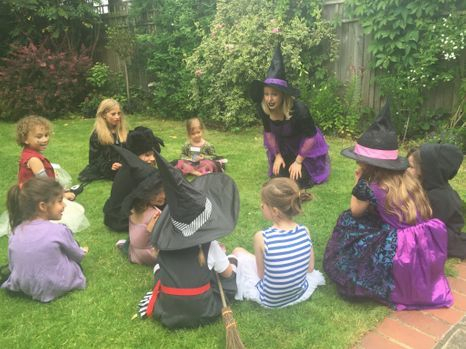 It can also be performed for large parties (over 30 kids) with the Witch and is perfect for Halloween parties! Offered in Hammersmith, Chelsea, Kensington, Chiswick and all over London and surrounding areas. Ages 3-9. Join the fairy and her desire to rekindle her magical powers! Listen to her amazing story of how she lost the power of her wand from the evil witch, Betsy Baggons V and travel on a mystical journey to her homeland of Butterfliatus to unlock the codes, use her fairy dust and find the Magical Fairy Sweets that will help her make her wand magical again!! 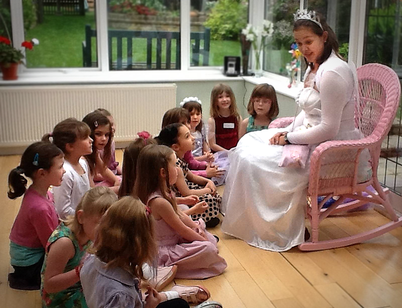 This sparkling fairy party is perfect for girls aged 3-6 and run by one of our actresses affiliated with the company in Kensington, Chelsea, Chiswick, Hammersmith, children's party entertainment in Streatham and all over London and the surrounding counties. Also works very well as a two-hander for big groups with Wizard Dee. This party is aimed at kids aged 3-6 and is perfect for those who are fans of the Cars and Cars 2 films. Sergeant Dan works for a special military division working on missions in the jungle! He is about to embark on another mission deep in the Asian jungle and his boss wants him to get fit again after a long break, with the help of some young recruits! 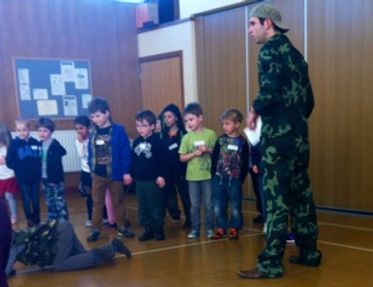 Join Sergeant Dan on a special action-packed military adventure party with activities including: press ups, chanting and an assault course! Great for boys and girls who like soldiers and the army. Aimed at kids aged 4-9. Join Knight Daniel on a magical quest to help rescue his sister, the Princess, from the evil clutches of Lord Christopher III... 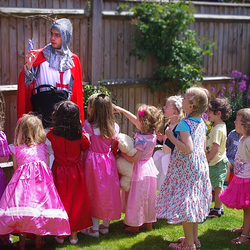 This party is based on the same story as the Princess Adventure (see below) and is also ideal for large groups over 30 for two actors as the Knight and Princess! 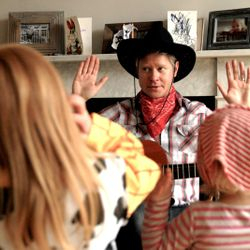 Aimed at ages 3-6, this party is ideal for those that are fans of the Cbeebies hit TV programme, Mike The Knight. Danzar the Human Monster 'Rock Star'! Follow Danzar the Human Monster- who used to be a normal human in a rock band- on his latest mission to help save the good monsters. Set off on his spaceship and travel to the crazy planet of Bacaria to find the Monster Sweets! Great for kids who are in to monsters and aliens (good ones of course!) and like to emulate themselves on famous Rock singers and musicians! Ages 4-7. Detective Dan is a very busy man. So busy in fact, that he needs some kids' help to crack the latest case set to him by his boss, Mr Superintendent. The case in hand? To find the Super Sweets that have been stolen by the nasty, evil criminal, Ugly Face Frank! Great for kids who are interested in the police and case solving! Detective Dan and the Pokemon Adventure! Join Detective Dan on a unique adventure for Pokemon fans- the craze sweeping the world! Warm up by reaching up for the Poke Balls and Ultra Balls, listen to the story of how a Mewto Pokemon vandalised a train station, use your Pokemon knowledge to figure out the cryptic questions and go in search of the Super Sweets to help beat Ugly Face Frank! NEW- Detective Dan and The Minecraft Adventure! Join Detective Dan on a brand new adventure for Minecraft fans. Explore your favourite Minecraft characters, make imaginary blocks, listen to Detective Dan's amazing story involving an Ender Dragon, test your Minecraft knowledge to help crack some codes and go in search of the Super Sweets that have been stolen once again by Ugly Face Frank! Music Dan loves music. 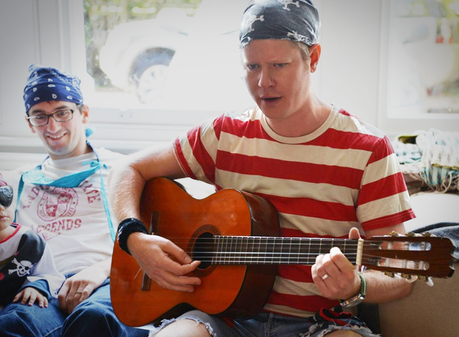 He loves playing the guitar, drums and piano and he loves singing! He plays at all sorts of occasions but, most of all, he loves playing music with his friends... But, he's been rather tired recently due to too many late nights watching music DVD's! 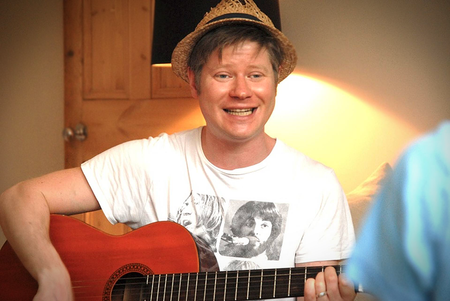 So, his music manager, Mr Harpsichord has set him a series of musical and physical tasks for him and a group of kids to help him be more energetic again! Great for kids who are in to music and have lots of physical energy. Cowboy Dan is a little bit sore. He fell off his horse whilst practising what he loves doing more than anything- rodeo riding! But, in order for him to enter the next big competition in the mid-west of America, where he's from, he needs some young cowboys and cowgirls to help him get fit again! 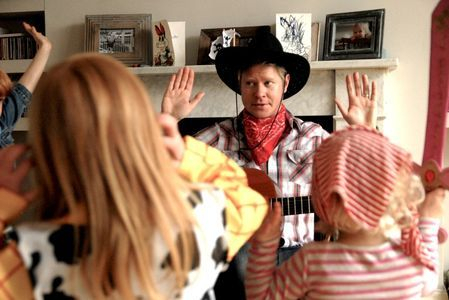 This party also works very well for large groups of over 30 kids with two actors as The Cowboy Cousins! It can also be adapted as a Cowgirl party run by one of our actresses. Ages 3-7. Builder Dan loves his job. So much so, that during all the banging, nailing, drilling and bricklaying, he sings! 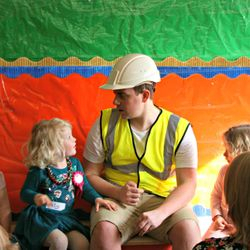 But, despite having a great job on at the moment (building a big sports hall for a rich lord), the site where he works has been damaged by a gang of foxes and he needs the kids help to re-build it using the power of their imaginations! 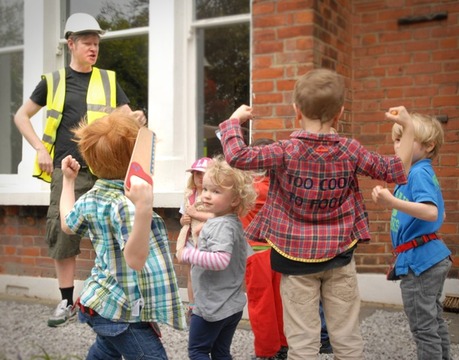 Aimed at kids aged 3-6 and perfect for fans of Bob The Builder. Danny Bond, cousin of the infamous spy, James Bond, has returned from the jungle where he was held captive for six months by the evil oil head honcho, Mad Marco III. Confused, rough round the edges and with his skills not up to scratch, he needs a team of young spies to help him get back to mental and physical fitness. Using a series of tasks, the children will help Danny to go back to the Secret Services ready to catch evil criminals again! A great party for kids with active imaginations and quick-thinking skills from ages 6-9. Sportsman Dan needs to get fit again. So, he is asked by Mr Olympics (the man that organized the 2012 London games) to find a team of young athletes to make a super team to enter the New Kids Olympics! He tests the kids physical fitness and asks each one to show off their favourite type of Sport (eg. Triple jump!) which eventually leads to a series of sporting tasks and ends with everyone winning a gold medal each! 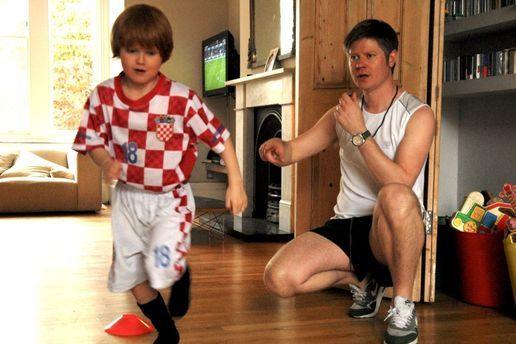 Perfect for children who love sports and games and are aged 6-9. 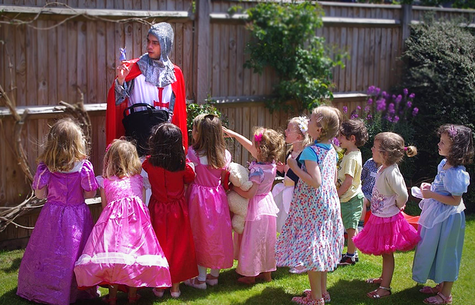 The princess welcomes the children outside her magical castle and gets to know all the other princesses (and princes too!). She then tells them that she has been held captive by an evil lord and she needs the children to play some games with her and follow the tasks set on a special map by the Fairy Godmother (who has let her out of the castle for one day only!) to help her escape forever! 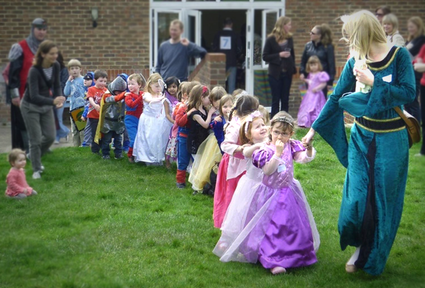 Our marvellously magical princess themed party is perfect for girls aged 3-6 who are fans of the popular Disney film, Frozen, and run by one of our actresses affiliated with the company in Battersea, Kensington, Chelsea, and across London and the surrounding areas. Go on a magical 'underwater' journey with The Mermaid and act out being Mermaids too. The mermaid needs the kids' help to retrieve the Magical Underwater Sweets Treasure stolen by the nasty pirate, One Leg Lucifer. Follow the clues with the help of Sammy The Starfish, written notes and a magic map to unlock the treasure! Perfect for girls aged 3-6 and also run by one of our actresses affiliated with the company. 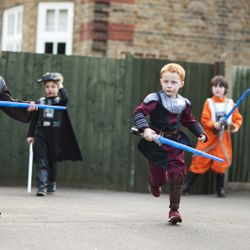 With a huge variety of party themes we are proud to provide children's parties in Wandsworth, Streatham, Clapham, Balham, Wimbledon, Chiswick, Shepherd's Bush, Hammersmith and all over London. You'll be spoilt for choice! 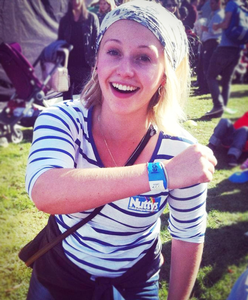 And every Nutty's Children's Party booking includes free downloadable invites! Handy! 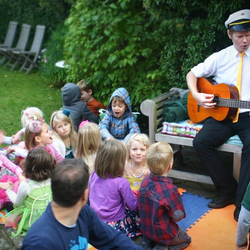 Our fun-loving Nutty's Children's Party entertainers offer kids parties in Forest Hill, Wandsworth, Putney, Primrose Hill, Richmond, Streatham, Clapham, Dulwich, Herne Hill, Hampstead and all over London. 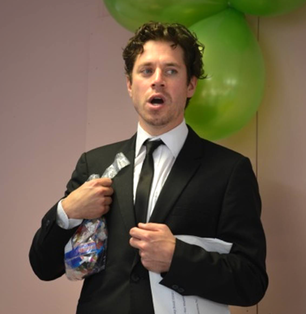 Our entertainers are all super-talented, experienced professional actors or teachers! Read about The Team. © 2006-2019 Nutty's Children's Parties. All Rights Reserved.